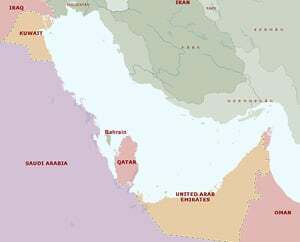 A map of the Gulf. Political analysts expressed cautious optimism over the prospects for greater democracy in the United Arab Emirates (UAE) ahead of the country’s first parliamentary elections on 16 to 20 December. The ruler’s courts of each of the country’s seven emirates handpicked 6,688 Electoral College members who will vote for half of the 40-member Federal National Council (FNC), a parliamentary consultative body for the federal government. “It’s a new thing for the country. We didn’t want to jump into a big process without first testing it on a smaller scale. So what we’re doing is a microcosm of what will be a much more inclusive electoral process further down the road,” said Lana Nusseibeh, Director of Media and Communications at the UAE Ministry of FNC Affairs. Set up in 1972, the FNC “is not really a body with real teeth”, said Nusseibeh. It does not have the power to draft or reject legislation, but only to send legislation back to the cabinet for amendment. Since 1972, all 40 members of the FNC have been appointed by UAE’s dynastic rulers. Now, for the first time, half of its members will be elected by selected members of the public. Criteria for the selection of these voters included having to be UAE nationals, residing in the UAE, being over 25 and being literate. The number of 6,688 voters was determined in multiples of a hundred based upon the number of seats each emirate holds in the FNC. Abu Dhabi and Dubai hold eight seats each, Sharjah and Ras al-Khaimah hold six seats each, and Fujairah, Ajman and Um al-Quwain hold four seats each. The other half of the FNC will continue to be appointed by the rulers. With one polling station per emirate, the Electoral College Members will vote for 439 candidates – who are also members of the Electoral College. Healthcare, housing and education have emerged as key issues among the candidates, 65 of them women, vying for a place on the FNC. Christian Koch, Director of International Studies at the Gulf Research Centre in Dubai, welcomed the “step by step” development of political institutions in the UAE. “The government of the UAE enjoys a high level of legitimacy among its population and doesn’t see an urgent need to take broad steps towards overall democracy,” said Koch. The UAE’s highest legislative and executive body is the Federal Supreme Council (FSC), constituted by the seven emirate’s rulers, who select a president and vice-president from its membership; the president, in turn, appoints the prime minister and cabinet. There are no general elections in the UAE, but citizens may express their concerns directly to their leaders through traditional consultative mechanisms, such as the open majlis, or council. The decision to elect 50 per cent of the members of the FNC was announced by President Sheikh Khalifa bin Zayed al-Nahyan in December 2005. This decision was just the first phase of a three-stage process of transforming the political system in the UAE. Sheikh Khalifa also created a 12-member National Electoral Committee in August this year to oversee the electoral process. In addition, Sheikh Khalifa outlined two other stages to be introduced in 2007 and beyond. Stage two is the expansion of the FNC to include a greater number of members to reflect the growth of the country’s population. This stage would also include a re-evaluation of the role of the FNC with a view to strengthening its role. Once the FNC has been expanded and empowered, stage three of the political reform process would allow all nationals in the country to vote for half the FNC’s candidates. Some analysts set the tentative first steps towards greater democracy in the UAE, a country in which there are no democratically elected institutions or political parties, against the rise of Islamists across the Gulf. That was a view echoed by analysts observing the parliamentary election in the tiny island Gulf state of Bahrain earlier this month. A first-round vote saw the country’s Shi’ite Muslim majority opposition movement, Al-Wefaq, which boycotted the election in 2002, take 16 of the 17 seats it contested, in an unprecedented challenge to pro-government Sunni parties. In the run-off, rights groups complained of fraud after Shi’ite candidates won just two of 11 run-off races, leaving them three seats short of a majority, with Sunni parties retaining control of the 40-member elected parliament. Shi’ites make up around 60 per cent of Bahrain’s population but, analysts say, have long been marginalised by a political institution that hands ultimate power of the state to its Sunni royal family.